Maybe there needs to be more training in dental school on radiographic diagnosis. This is by no means a case calling for plunging in and doing a root canal treatment. 1) While tooth decay will show up as a dark area, not all dark areas are decay. This could be a radiolucent base material under the filling, a gap in the filling, or decay – three different possibilities. 3) The dark area does not go anywhere near the pulp. Now there is an optical illusion that creates the impression that the dark area is directly under the filling and between the filling and the pulp. The way to deal with that is to cover up the filling, which is white, with your finger. Now look at the remaining tooth structure. When you do that, you can see the clearly defined margins of the dark area (decay would have fuzzy edges) and that they stop well short of the pulp. There are a good 2 to 3 millimeters of solid tooth structure between this radiolucent area and the pulp. Now I can’t give a definitive diagnosis here without actually seeing your tooth and finding out more about what went on, but I can tell you that if they are just relying on the x-ray, there is no justification for doing a root canal treatment. There is no indication of inflammation near the root tip, which is the first indication of an infected tooth. And you are saying that the tooth feels fine. Finally, there is some clear evidence on the x-ray that the root of the tooth is healthy. If you look at a clearly healthy tooth – for example, the canine tooth next to this one. There is a thin white line that goes all the way around the root of the tooth. This is called the lamina dura. When a tooth gets infected, one of two things happens to this white line. 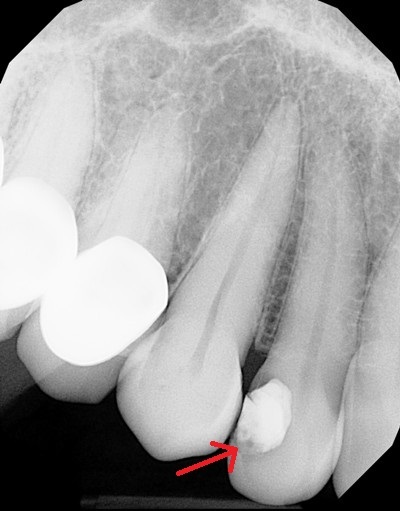 It either becomes broken in the area around the root tip, or it pulls away from the tooth. When I look at the lamina dura of your lateral incisor, I can follow it all the way around the root tip. Because of the angle, the lamina dura appears more fuzzy than it does on the canine, but it is nonetheless there and intact. THAT is the key to the diagnosis of this tooth. The root is healthy. My husband is scheduled for total hip replacement surgery in 2 weeks. He recently had tooth pain and went to dentist for xray. He was told he possibly needs two root canals in tooth #5 & 15 & put on antibiotics. He would like to postpone the root canal until after the surgery for a few reasons. What are your thoughts? Will the pain return once he stops the antibiotics? Yes, if the pain is from a toothache, antibiotics will not cure it. It will come back once he stops the antibiotics. I question the expertise of this dentist who didn’t explain this to you. What I would have done in your situation is give you two options – do the root canal treatment right away, or take antibiotics clear through the hip surgery and do the root canal treatment at the point near when you are done with the antibiotics. I’m also suspicious of this diagnosis of “possibly” needing root canals. Now I don’t know the whole situation, but in most cases the dentist should be able to determine this without throwing a “possibly” in there. If you have any vibes about this dentist that make you uneasy at all, I would go for a second opinion, maybe this time from a root canal specialist (endodontist). Jennifer – contact me through the Ask the Dentist a Question link and I’ll arrange for you to send me the x-ray.